In the world of bikes, suspension is the best thing since... well, there has never been anything like it. Since the early days of suspension in the early 90's, the question has always been "To service, or not to service." Alright, it's cold outside and your bike is sitting in your garage all tucked in until the warmer weather returns. Take this downtime to pamper your bike and make sure that everything is working properly for the coming season. Ever since its debut on the mountain, the suspension has been a staple in biking because it allowed for speed, comfort, and the ability to continue singing bass in the city choir. The modern fork comprises a spring to provide the bounce, and a damper to provide control and rebound. Together, the spring and the damper work together as the control center for your bike riding pleasure. The spring and damper are housed in the stanchions which are known together as the uppers. The uppers fit into the lowers and provide the bounce so you can get sendy in the gnar gnar. The lowers house oil for the damper and the spring and protect all that with a set of rubber and foam seals. In theory, it is just that easy; set it, forget it, and get after it- if you know what I mean, but it's not. That where mechanics come in. Suspension is great and that is just a fact of riding. it's generous and supple, just like your favorite yoga ball at the tai-chi studio where you do Pilates. However, there are lots of problems that can occur for your suspension. Here is a list of 5 things to look out for and be aware of about your suspension. Setting the sag is an important part of riding because it sets you in the right direction prior to any ride. Setting the SAG means that the pressure in the fork or rear shock is appropriate for your weight. 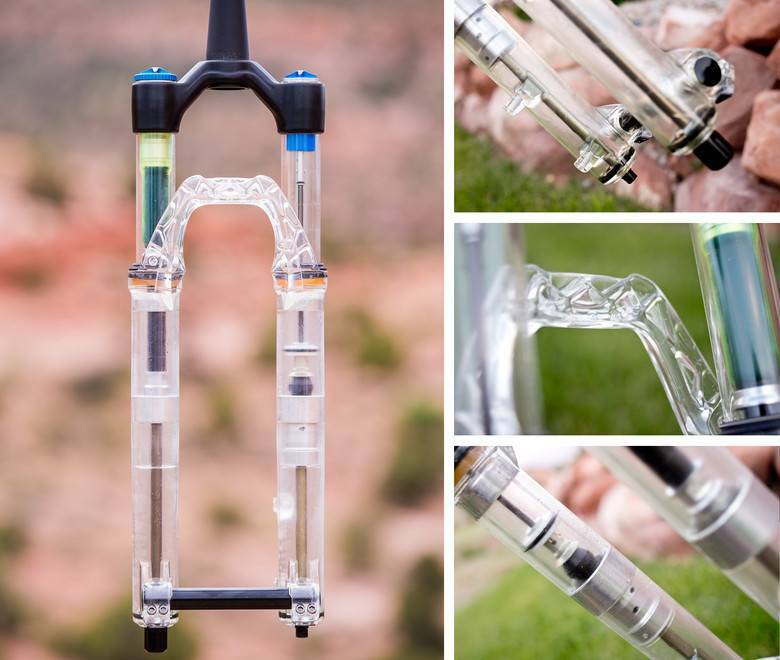 The amount of SAG correlates to the amount of travel left in the fork when you are riding and its adjustment for a firmer, or softer experience. To set the SAG, be sure to wear the gear you will be wearing while riding. This includes lunch and all the water or tools you will be packing. Now, on most forks and shocks, there should be a rubber O-ring around a stanchion. Before getting on the bike, slide this O-ring all the way down to the top of the lowers. Now get on your bike and assume your riding position. Now dismount from the bike and measure how far the O-ring moved. Compare this distance to the overall travel of the fork. The standard range for suspension SAG ranges from 25%-35%. If you are within this range, you are good to go, if not, using a suspension pump, adjust the pressure as needed and remeasure and get after it! To ensure the longevity of your bike, be sure to clean off the stanchions after every ride. Making sure to clean your stanchions will ensure that you don't get any grit or dirt in the lowers and will protect your suspension components for years to come. We recommend using either water or isopropyl alcohol and a microfiber rag. If you feel snazzy and want to pressure wash your suspension, be sure to either turn your bike upside down or not do it at all. while your seals will keep out water, pressure washing the seals is not a great idea. Every so often, be sure to check your stanchions for scratches or general wear spots. If there is some scratching or cable rub going on, bring in your bike and we can take a look and see what we can do. The problem with a scratch on the stanchions is that it can be an opening into the inner workings of your fork and lead to contamination and the ultimate destruction of your fork. If you are worried about wear, bring it in and we at Noble Cycling can take a look at it and give you a recommendation. Don't be like me and think it is alright. While it might be okay for a time, eventually those things add up and in my case, the whole crown the fork cracked in half on the landing of a jump. This is not a good time to realize your fork may be is worn. The seals are the built-in protection for your fork and shock. These little guys are the best bet you have to maintain the life of your suspension. They keep out dirt and grime and keep the suspension springy. If you can see that the seals are either misshapen, contaminated, or just old and crusty, proceed directly to the next tip and we will see you soon. What matters most is where and under what types of conditions you are riding but the general rule of thumb is to get your suspension serviced once a year. Getting your suspension serviced will get your shock feeling like new and get you back on the trails. Getting your fork serviced includes new seals, new oil, and a new smile on your face knowing that you aren't going to have sludge build up in your fork when you are taking some drops. Getting a suspension service will prolong the life of your bike and ensure that you have a good time.